Being original is a hard achievement to succeed at these days. We are constantly bombarded with so many information that it’s sometimes almost impossible to think outside the box. Whether you’re writing a book or a screenplay, trying to paint or you’ve decided to build something – it’s vital to be yourself. 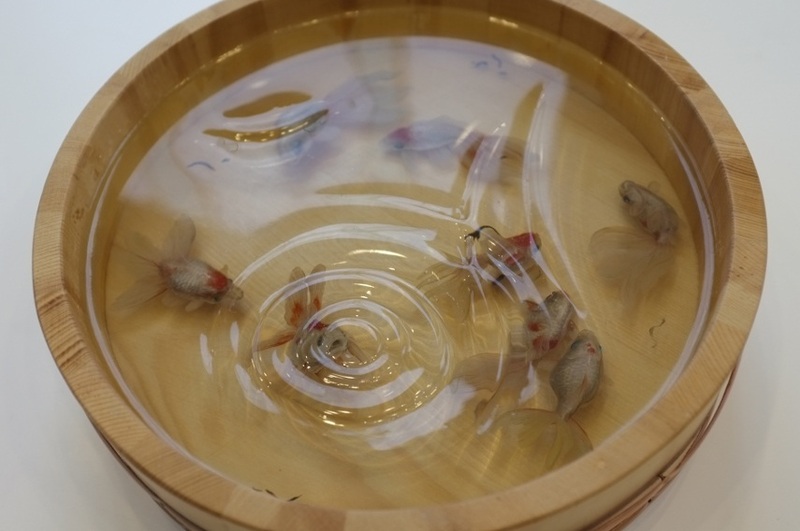 If you think it’s too hard or impossible to be one hundred percent original, you should definitely take a closer look at Riusuke Fukahori – this Japanese artist is best known for his three-dimensional goldfish paintings created by pouring resin. His work is so inspirational, you will wish to try painting these fishes yourself! Only you will probably fail miserably as Fukahori’s art is a hard thing to master – something you will come to see shortly. 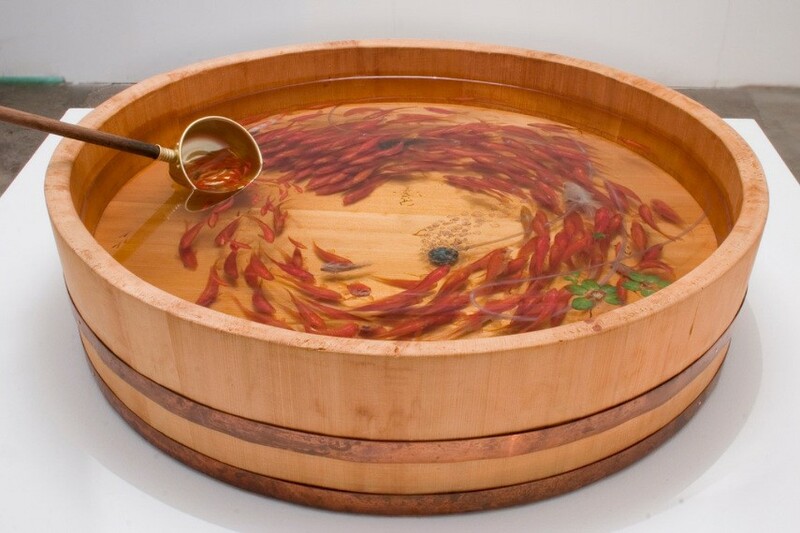 Riusuke invented his unique way of painting during the year of 2002 – it was then he created his first goldfishes by pouring resin. It took him full eight years to master this way of painting and his first publication came in 2010. At that time, Fukahori knew what he wanted to do with his life, but that was not always the case. Originally, he desired to be a formative designer. 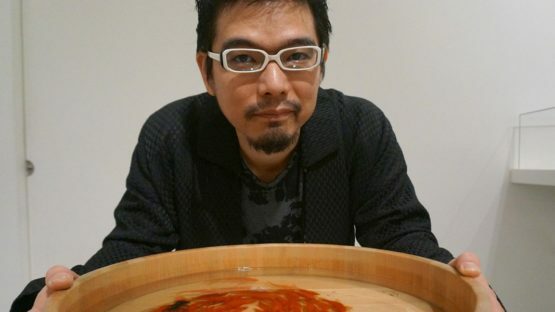 He graduated at the Aichi Art University Department of Design in 1995 with flying colors. Riusuke started working, but the designer business wasn’t anything as he imagined or hoped it to be. In 2000, his career hit a low point as he wasn’t succeeding to make a deadline in time. While he was eating away at himself for not completing the tasks assigned to him, Fukahori glanced towards his pet goldfish as it swam in dirty water. Beeing so involved with work, Riusuke forgot to clean the tank and feed the fish for quite some time, but the little swimmer was still alive and well. 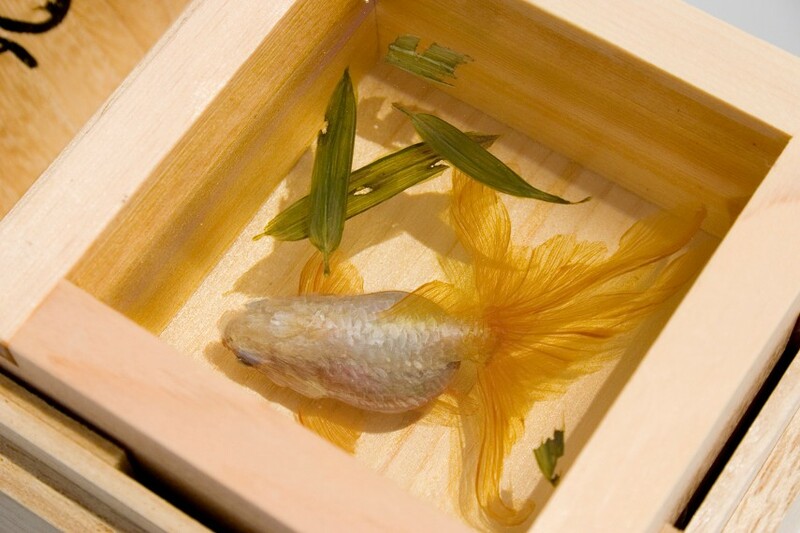 Such resilience inspired Fukahori more than all the years spent at college and the distinct beautifulness of the goldfish surrounded by murky water was enough to make him realize he was wasting his life away on something he doesn’t even love anymore. In an instant, his artistic side grew into an uncontrollable desire to depict goldfishes in all their beauty. Riusuke Fukahori calls this crucial moment of his life The Goldfish Salvation. It took some time while Fukahori perfected his creative method. Fukahori didn’t simply paint goldfishes – by altering between pouring resin into a vessel and painting with acrylic paint he started giving the resulting work a three-dimensional optical effect. Which brings us to the next aspect of Riusuke’s art, the aforementioned vessels. Vessels are items on which he displays his goldfishes, which for him means the vessels can be almost anything he can get his hands on! Riusuke’s depictions can be found inside many common household items of Japan, such as sushi okes and cypress sake cups. Of course, sometimes his work can get a bit too large to be fitted inside a cup, so that demands a bigger working ground, like giant paper surfaces and wooden planks, or even glass. Technically, Fukahori does a repetition of liquid resin pouring and acrylic painting. And as layer by layer resin rushes into the volumes and dries, he repeats his method until it finally gets the desirable three-dimensional effect. To say these fishes are realistically depicted would be an understatement – Fukahori prides himself with the fact his goldfishes have reached an optical point they seem not only real but actually present in front of you. This level of mastery Fukahori reached can be a linked to his studio which is notoriously filled with tanks full of goldfishes! He spends days upon days living beside and observing these animals, learning all he can about the little swimming creatures. Riusuke claims he never uses photographs of models for his work. Everything he paints comes directly from his memory and imagination. His innate fascination and infatuation with the swimming creatures aroused in him a creative preoccupation, studying, watching and understanding their movements in pursuit of recreating them as highly-realistic, near sculptural depictions. Fukahori says his art is highly influenced by Claude Monet and the way he depicted water surfaces in his famous late 19th century series of Water Lillies. Sure, the French father of impressionism had a lot different approach to painting, but if we were to make a comparison with Riusuke we would be able to see some resemblances. There is also a darker theory that could be fueling Fukahori’s art – his fishes could be all metaphors for the confinements of modern life. This makes sense when you realize that all of his goldfishes would not have any room to swim in their vessels if they were to suddenly come to life. But, ultimately, what drives this Japanese artist are his subjects. Such obsessions are not common, especially not when they last for years like in Fukahori’s case. When asked about such an unusual source of inspiration, he replied: I’ve been depicting an uncountable number of goldfish in my work, but the mysterious pull towards goldfish will never die for me. The impulse of exploration – What are goldfish? – drives me to create more. Where and how they want to swim, and what they think; these are the questions that I’ve been asking myself when I paint goldfish. I believe this process will help breathe life into the goldfish in my works. Commitment Fukahori shows his subjects is a real rarity in the modern art world as he has stayed true to them for his entire career. He made a unique connection to goldfishes and understands all about them. Unfortunately, since these animals have that notorious memory defect, they can not return the favor in that way; but what they can give Riusuke is an unlimited drive to create pieces of art that continue to amaze us. That seems like a fair deal. Riusuke owes everything to the forgotten fish he accidently saw in his apartment whilst working. As he states: I didn’t invent resin and not the first to use resin. I am not a resin artist. I am an artist saved by goldfish. I think there are people who try to imitate my work, but I believe that they fail at selecting the most appropriate vessel. The vessel in which the goldfish swim in is the key. They will never understand goldfish the way I do. They are only copying the craft, not the soul. The artist is represented by JOSHUA LINER GALLERY in New York. Riusuke Fukahori lives and works in Yokohama (Japan).